The Horizon Torus 5 multi-gym offers an unbelievable training variety. Common units like chest press, lower cable control, and a free cable control are integrated in the Torus 5 as well as a dip station and even a leg press. The Horizon Torus 5 multi-gym offers many exercises for the whole body. 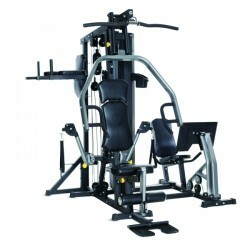 Besides common functions of a multi-gym, the Horizon Torus 5 multi-gym is additionally equiped with a dip station and a leg press. On the side of the home gym, there is a free cable control in addition. Exercise back and neck muscles as well as the biceps on the lat pull station. A leg press is integrated for training of the quadriceps. The multiple adjustable lateral cable control is very versatile, exercising effectively chest, back, and shoulders. The dip station is optimal for training of shoulders, triceps, and abdominal muscles. Achieve stronger calf and thigh muscles with the leg curl. The lower cable control is suitable for rowing exercises in sitting position or effective biceps/triceps training in standing position. The Horizon Torus 5 multi-gym is equiped with a very sturdy frame; it is made of galvanized and powder coated steel tubes. The traction cables are 6 mm strong and encased with a nylon shell. They run better on the guide rollers and have a longer lifespan. The ball-bearing guide rollers run smoothly for a very comfortable training, because there are no peak loads at the beginning of the training movement. The Horizon Torus 5 multi-gym is also comfortable, because the seat and back upholsteries are multiple adjustable. Furthermore, the Horizon Torus 5 multi-gym provides already complete accessory for a more varied and more effective training ! Horizon Torus 5 multi-gym add to comparison list.